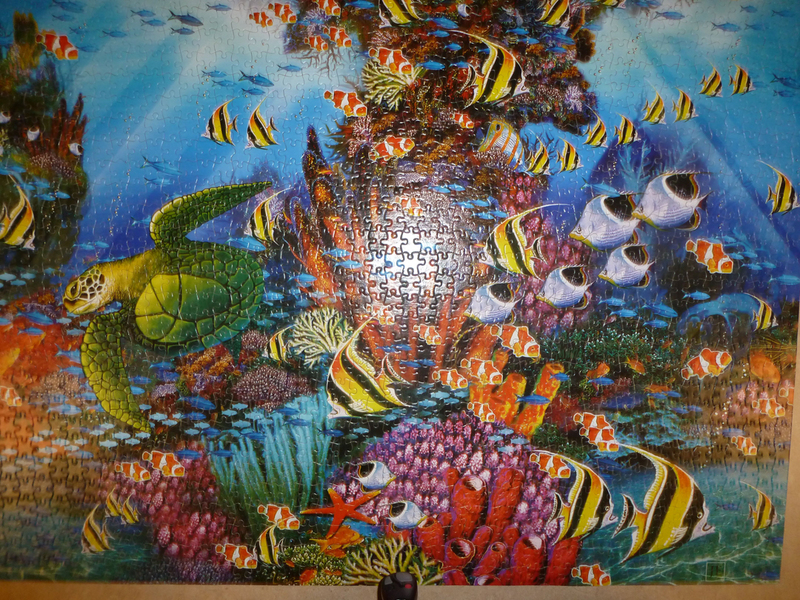 My last blog post showed some of my friends working on a 1000 piece puzzle. A very difficult puzzle. I did put a few pieces in it, but I didn’t work on it very much. My job is the official photographer for every puzzle they do!… and they have done a lot of puzzles! Some of my viewers asked that I show the finished product. Try to count all the little blue fish. No, I don’t know how many there are! As soon as this one was finished, it was transferred to another table,(by moving the other table up next to the first one, and sliding the puzzle over!) and a new one started. Why don’t you pull up a chair and have a cup of tea… the kettle is boiling, and maybe I can find some cookies! Hi Carol, thanks for stopping by and for your comment.. I do appreciate all those who do come and comment. Let’s have that cup off tea. Quite the accomplishment , my hats off to the puzzlers 🙂 Your photograph of the puzzle is picture perfect. We can see all the details. Thanks for dropping by, Kallie. Glad that you have started to Read Johnny and Mr. Fredericks to the grandchildren. I do hope they enjoy it as much as ours did. Tea? Cream? Sugar? HI Norman, Thanks for coming by… the kettle is boiling so join us for a cup of tea. And thank you for the visit. Thank you for the picture, Norma. If you have a little honey for my tea, I’d appreciate it. I’ve been fighting a sore throat and cough for the last ten days. Much better now, so perhaps I’ll be a little more prompt with my visits when your door is open. Hi Judith. The honey is all ready for you, and the kettle is boiling…. and my door is always open for you.